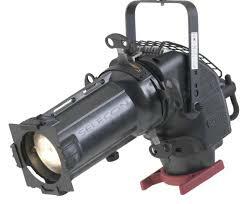 Selecon Pacific 14°-35° Zoomspot | PRO MUSIC, s.r.o. Your choice of popular mains voltage tungsten halogen light sources plus discharge light sources for high performance, long life requirements. Easy lamp alignment from true peak to flat – using the Selecon central gear mechanism to smoothly adjust the lamp position achieves the beam distribution and even stage coverage you want without having to pay for diffusion frosts. Integrated Dowser dimming accessory provides full range dimming of arc light sources. Fast and simple to focus using the cool touch operational controls. Lens tube with integral shutters rotates 360° allowing quick and precise setting of required shutter cuts. Align the pattern image accurately using the adjustable pattern holder. Active Heat Management System allows for the use of cost-effective DIY plastic image projection using overhead transparency film and selected light sources. Two pattern (fixed and rotating combination) / effects mounting positions. Base down lamp positioned axially in reflector optimizes the light collection for better light output. The lamp socket and cabling are carefully positioned out of the heat exhaust which guarantees you a lower cost of ownership through reduced downtime and maintenance. Automatic mains power disconnection when the lamp house is removed for lamping. No chance of mounting a lamp into a live socket. Cooler operating controls (lens, focus knobs, lamp peak/flat adjustment, shutters) even after hours of continuous use provide a safer lighting tool for you. 1× color frame, 1× fitted safety chain, 3ft mains cable, 1× suspension bolt set, 1× heat sink guard and short form instruction manual.